For United's return to the Premier Division, the Club entered a new deal with Pony, who had already been supplying the Club’s kits for the past two seasons. The newly designed Away strip for the 1996/97 season had similarities in fashion to the Home strip. The white top again had the diagonal tiger stripe effect though-out, but this time with black panels down the side of the top as well as down the sides of the sleeves. 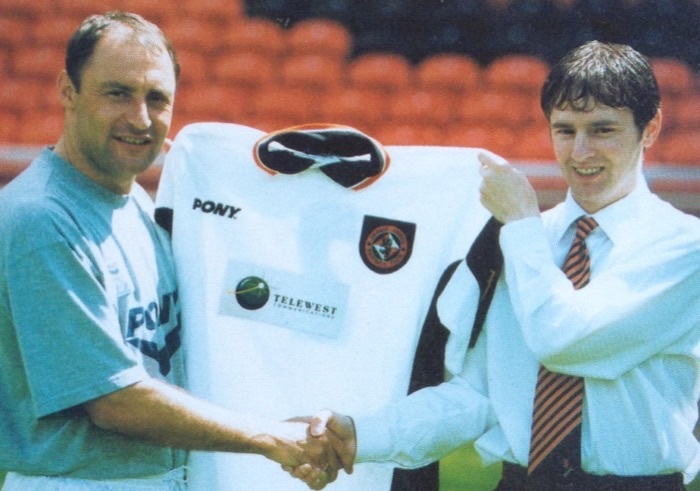 The black collar was more of a polo style, with white and tangerine trim and a single button. 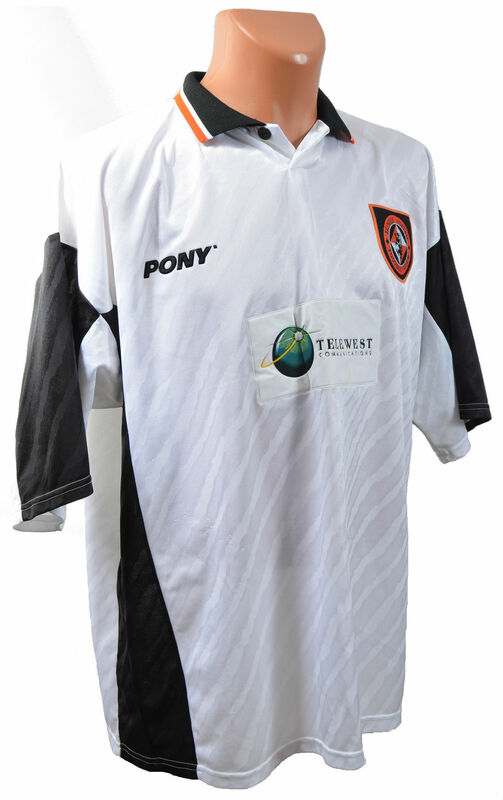 The new one year sponsorship deal with telecommunications company Telewest saw their logo appear on the front of the shirt, replacing Rover from the previous two seasons, but the white paneled logo didn't stand out as much as it did on the Home shirt. The circular Club badge was backed with a black shield for the fist time, just like the Home shirt. The white shorts had a thick black strip down both sides, as well as the shielded circular badge in the bottom right corner. The new socks were mostly black, with a white top and two white bands lower down near the ankle. The Away kits first match was possibly at Tynecastle, where United lost 0-1 to Hearts in September 1996. After replacing Billy Kirkwood as manager just weeks into the season, new manager Tommy McLean brought in three Scandinavian players who would help turn the Club's season around. Erik Pedersen, Lars Zetterlund and Kjell Olofsson all went straight into the team, and after just two defeats in the next two months, the side went on an amazing 17 game unbeaten run which took them to a 3rd placed finish in the Premier Division, qualifying for Europe in their first season back in the top flight.